Jerry's Marina is now celebrating 60 years in the boating business. 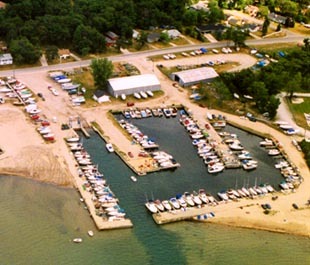 With 200 boat slips, complete new and used boat and motor sales, well stocked ships store, and factory trained mechanics, we are the largest marine dealer in Northeastern Michigan. Concerning dockage, yes we do have slips available for boats 18-37ft in length. We have adequate water depth throughout our channel and basin. The larger slips do go fast, please contact us for availability. Motor City Kiteboarding is located upstairs. Consistent winds, clear, warm water, and abundant sandy beaches make Tawas Point a kiteboarding nirvana, with conditions ranging from shallows for lessons, speed slicks, downwinders, and waves. Our exclusive shallow water lesson site is perfect for learning. Experience the pristine natural beauty of Tawas Point and maximize your learning and freeriding with our local expertise.